Gone are the days when making coffee was a simple affair. During the past decade or so, a new generation of coffee addicts seem to have emerged, with very particular tastes and preferences. And to meet their arcane and hyper-specific needs, a wide range and many different types of coffee makers have hit the market. While this has left people like you with a wealth of products to choose from, it has also made the task quite a challenging one. That being said, if you’re reading this, you’re not going to have to research dozens of products just to “try” finding the right one for you - we've done it for you. Here are the best coffee makers on the market available at three different price points, and you can simply choose the one that best fits your needs and budget. It will not only help you save a ton of time, but also avoid going for the wrong one. So without further ado, let’s take a look at these products. If you’re on a tight budget but don’t want to compromise on the many advanced features most high-end coffee makers come with, the Cuisinart DCC-3200 may well turn out to be your best bet. It serves you perfectly hot coffee that tastes great, allows you to choose from different brew strengths, and is a fully automatic machine that also comes with a self-cleaning feature. It’s actually one of the latest models of Cuisinart coffee makers, and fixes some of the design flaws found in the older versions. The DCC-3200 is surprisingly fast at making great coffee – you get your cup of coffee before even you know it. It’s a 14-cup coffee maker, and one of the rare few in this price range. However, unlike some others, it doesn’t compromise on the flavor or features to offer the extra capacity, which is quite impressive indeed. While the new glass carafe it comes with looks very similar to what the older versions had, it’s actually a little larger. 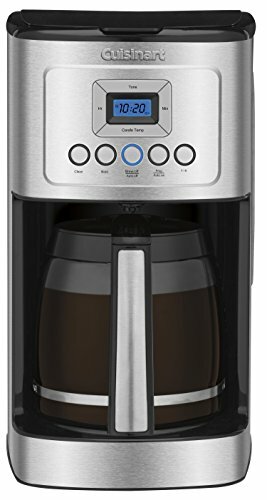 However, one surprising change that you won’t notice first is that it brews coffee hotter than most coffee makers out there, let alone the ones in this price range. It also notifies you about your coffee being ready - if you want. Despite the surprisingly low price tag, the machine looks pretty good and boasts a reasonably good build quality. It has stainless steel on the front while its sides have a richer, more expensive look to them. 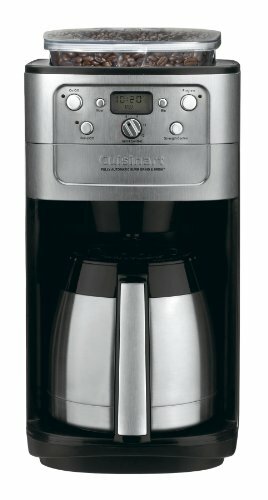 The lid also doesn’t leak when lifted upward, which is probably a common issue with many coffee makers, especially in this price range, including the older versions of this Cuisinart coffee maker. Finally, while there seem to be a few customers complaining about a plastic smell, it really isn’t a major concern as it goes away after a few uses. Apart from that, everything seems to be just perfect about this little beauty, especially given its surprisingly low price. We have a much more detailed review here. First things first, this is a fairly expensive coffee maker. However, surprisingly, it doesn’t come with any of the bells and whistles you would expect with a product in this price range. In fact, it’s more of a “minimalistic” coffee machine. That being said, however, it doesn’t mean it’s not worth your money. It might not be one of the most advanced machines out there, but it’s certainly one of the best at what it’s supposed to do: make delicious, strong and hot (and we mean VERY hot) coffee. We can’t emphasize enough how impressed we are with its ability to produce blissfully hot coffee that stays hot for quite a while. In fact, Bonavita claims that it’s the only machine on the market that comes with a 1400-watt heater. This helps it heat up the water to 195-205 degrees, which is believed to be the perfect temperature to get the most out of the grinds. Also, you not only get served piping hot coffee, but it also stays hot for hours, thanks to the premium-quality glass carafe. This is actually something worth taking into consideration when deciding on a coffee maker, as coffee not staying hot is one of the most common complaints many people have with their coffee maker. Similarly, the waiting time is just as impressive, as you’ll be getting back your hot, flavorful coffee in just around 6 minutes. It also turns itself off automatically after 15 minutes. The machine is pretty easy to clean, too, which is again something that tends to be bit of a challenge when using a high-end coffee machine. In conclusion, it’s not something that will please everyone, especially those looking for a lot of advanced or extra features. That being said, anyone expecting piping hot, delicious, strongly flavored coffee without much waiting will definitely love it right from when it serves them their first cup of coffee. Similarly, if you’re looking for one of the best thermal carafes any machine can come with, that keeps your coffee hot for a reasonably long time and pours easily, a nice little compact machine you won’t have a problem storing, great build quality with high quality stainless steel, as well as one that’s easy to clean, look no further! You have just found the perfect product in the Bonavita BV1800SSB. We have another Cuisinart product on this list. However, this one’s in the mid-price range. Unlike the Bonavita coffee machine reviewed above, however, it does come with a fair few bells and whistles such as 24-hour programmability, brew and pause function, automatic burr grinder and more. It also boasts solid build quality, is a fully automatic machine, and comes with a capacity of making 12 cups of “freshly” flavored coffee, thanks to the charcoal water filter that doesn’t allows anything other than the freshest coffee to flow through. It’s also reasonably easy to make strong, medium or mild coffee using this machine, though you may have to do a bit of experimentation with the settings. However, no matter the settings, it always makes you an excellent cup of coffee. You will be particularly pleased with the taste if you’re a fan of mild, smooth, but flavorful coffee. While it’s not the easiest machine to clean, the little effort may turn out to be well worth it given the great taste and all the other useful features it comes with. Finally, it's extremely durable and should last you years. So while you might 'save' money by buying a cheaper model, that's likely to break down after a while. All in all, the DGB-900BC is great value for your money. While you have just read our reviews on three of the best coffee makers in different price ranges, you may still be a little confused about which one you should be going with. You might even want an espresso machine instead. Well, here are a few tips that will help you decide. While many other buying guides on coffee makers go into too much technical jargon, we think it’s better to keep it simple and stick to what you’re exactly looking for. And that means the first thing you need to consider is the taste you prefer. Do you like sticking to one particular flavor all the time or would want to try out different ones? In case of the former, you can go with the Bonavita BV1800SSB, the second product on the list. However, if you like to have different flavors, you may want to consider the first or the third product, as they offer different brew strengths and flavors. This is pretty self-explanatory. If you need to make a lot of coffee at once, (e.g. in a busy office or if you host regular soirées), you can go with a 14-cup machine. But it may also mean making a bit of a compromise on the quality front - unless you’re paying a pretty penny for it. That being said, you may want to stick to a good 12-cup machine if you don’t really need the extra capacity. While these two might not seem to be very important features, they can make or break your coffee experience, especially if you’re a regular user and going to use the machine many times a day. The thing is that many a time, long waiting times can get a little frustrating. No one likes to wait for their coffee for an awful amount of time. While you can get around it sometimes if you get yourself a programmable machine, it still won’t be practical to always rely on that feature as you never know when exactly you would like to get served a delicious, hot cup of coffee. This again makes the Bonavita BV1800SSB a winner here, though you may want to settle for the Cuisinart DCC-3200 if you don’t have that kind of budget. Similarly, the carafe quality is quite important, too, because it’s probably the only factor that comes into play when it comes to keeping your coffee hot. If it can't hold heat, you have to drink your coffee as soon as it’s brewed. 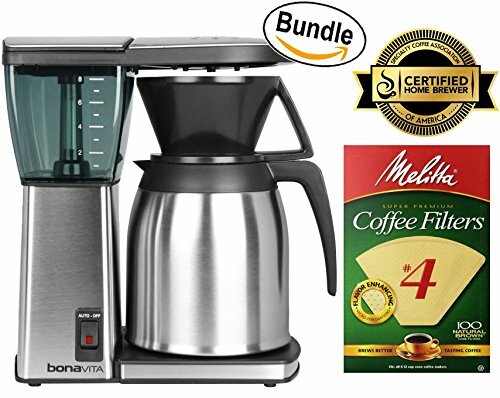 The Bonavita BV1800SSB’s thermal carafe is capable of keeping your coffee surprisingly hot for a good few hours, so again, it may very well hit the spot for you if you don’t like to gulp down your coffee as soon as it’s made. Add a thermal mug so you can take it with you!